The Isle of Wight has England’s largest sustainable population of red squirrels… and no grey squirrels! 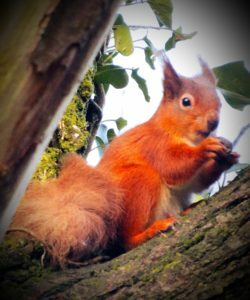 Although there are not as many red squirrels here as there are in northern Britain, because there are no grey squirrels the reds here are not under direct threat. The Island offers one of the best opportunities in this country for the long-term sustainable conservation of the species. The shy red squirrels are not nearly as easy to see as their grey cousins, but in some of Gift to Nature’s sites you stand a good chance of spotting one. We’re hoping to make that a bit easier by attracting squirrels to safe feeders in well-managed habitat that will suit squirrels, helping them survive and breed as well as providing enjoyment to us humans! Our campaign ‘Nuts to Squirrels’ is a way for everyone to chip in and help our tufty friends. 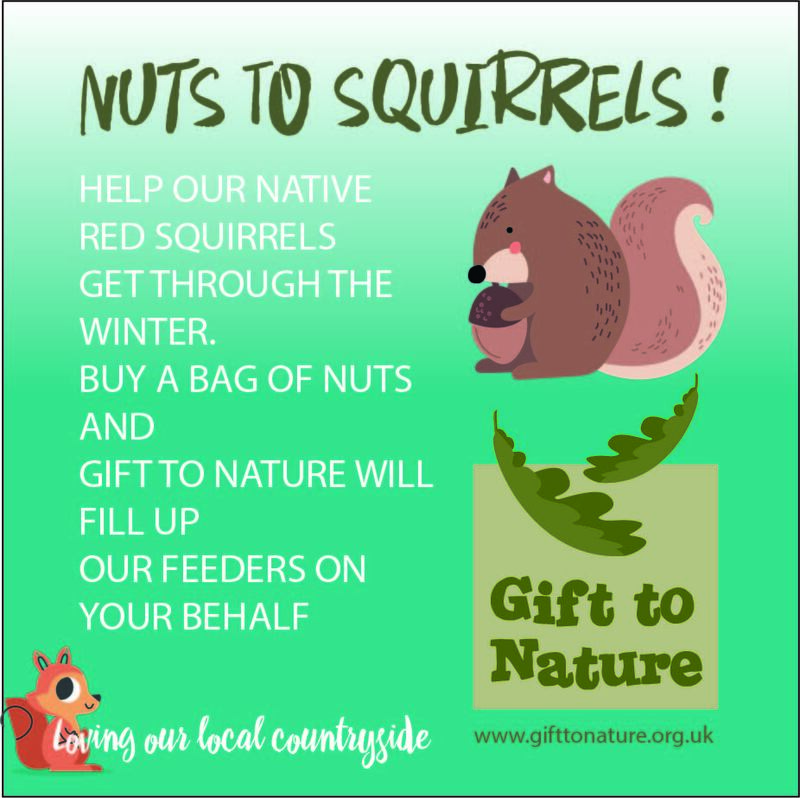 We are collecting funds to stock dedicated squirrel feeding stations at the Gift to Nature Red Squirrel Hide at Parkhurst Forest. Join in and give those squirrels something to go nuts about! We will use the money to buy squirrel food (yes, mostly nuts) and feeders, and to manage the woodland around the Squirrel Hide and in other squirrel habitats to ensure it is safe and suitable for squirrels to use. Or you can even buy a bag of squirrel-approved nuts in our Newport-based shop. We’ve had some expert input: Helen Butler of the Wight Squirrel Project supports the project and has given us advice on how to best set up the feeding station. Feeding red squirrels in times of food shortage, such as the late spring and early summer, helps their survival and provides hours of entertainment for you. Food may be put out at any time of the year but squirrels usually disappear from feeders when their natural food is plentiful. This is generally about the beginning of August. They will come back when they have fed well and stored nuts for the winter. Red squirrels need to gain 10% of their bodyweight to see them through the winter months. Read more on the Wight Squirrel Project website. If you’re lucky enough to spot the squirrels in our sites (and beyond) we would love it if you could report your sight seeing to the Wight Squirrel Project. Reds can be seen at times almost anywhere on the Island where there are trees, but they can be tricky to spot, as unlike the greys, they like are solitary creatures who to stay high in the trees and don’t often come down to ground level. That is, unless there’s some food for them. One of the best places to look for squirrels is the Gift to Nature Red Squirrel Hide at Parkhurst Forest. Here you can sit in comfort, learn about squirrels and maybe even see some up in the canopy. Peak activity times are dawn and dusk all year. Squirrels react to sound and movement, so stand still and keep quiet.